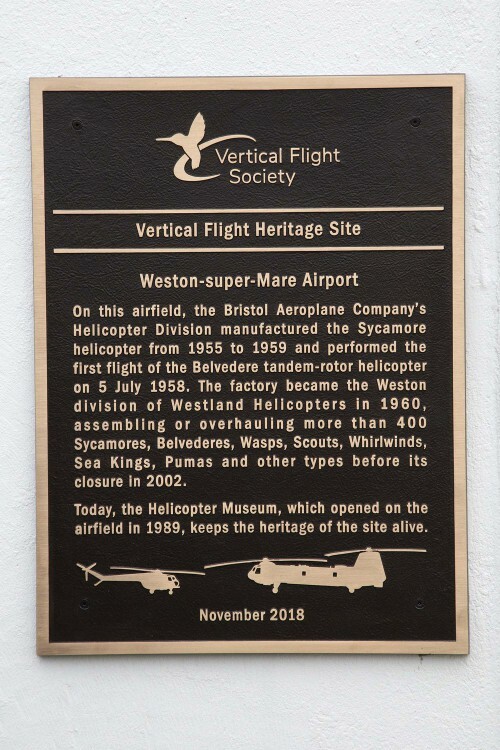 At a ceremony on Nov. 15, 2018, the Vertical Flight Society officially recognized Weston Airport, Weston-super-Mare in Somerset, UK, as a VFS Vertical Flight Heritage Site. The land is now owned by The Helicopter Museum, the world's largest dedicated helicopter museum, and the plaque was installed on the Museum's restored World War II era control tower/pilots' block. The historic buildings now house the Weston Aviation Exhibition telling the story of the area's aviation history including Weston Airport, Royal Air Force (RAF) Locking and local aircraft factories. and David Jolley, Chairman of North Somerset Council. Additional photos are available in the VFS Photo Gallery. The Vertical Flight Society — founded in 1943 as the American Helicopter Society — is the world’s oldest and largest society dedicated to advancing vertical flight technology. The Society’s Vertical Flight Heritage Sites Program recognizes and helps preserve the important vertical flight historical sites around the world. The Weston-super-Mare Airport has been involved with helicopters since Bristol Aeroplane Company Chief Helicopter designer Raoul Hafner temporarily located his office at the Banwell factory in 1945. From 1955, the main Oldmixon Factory manufactured the Sycamore helicopter and completed development of the Type 192 Belvedere, which first flew at the airfield on 5 July 1958. Subsequently the Oldmixon factory was taken over by Westland in 1960 and became involved in Wasp, Gazelle, Puma, Lynx and Sea King production and overhaul work for more than four decades. 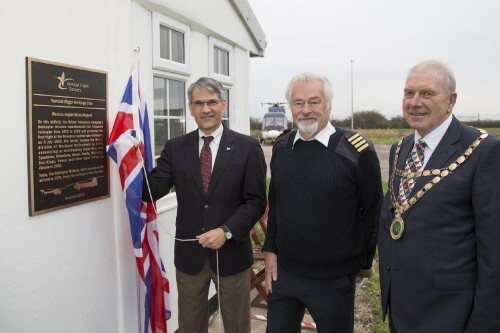 "We were delighted to host the naming of Weston Airport as a Vertical Flight Heritage Site," said Elfan ap Rees, Founder and Chair of The Helicopter Museum, "the more so as The Helicopter Museum is the last piece of that history still surviving and includes helicopters built and overhauled at the airfield in its collection. The recognition by the VFS is also a great honor and we are grateful to Mike Hirschberg for taking the time to visit personally to unveil the plaque." This is the 10th location to be recognized as a Vertical Flight Heritage Site since the program was initiated in 2013. The site has been the focal point of aviation at Weston-super-Mare since the all too brief peacetime years before World War 2. Primarily it has been a vital centre for rotary winged activity leading to the development of the helicopter in the UK. The work of Raoul Hafner, who was responsible for the Bristol Aircraft Company’s helicopter work, resulting in the Sycamore and the Belvedere was finally brought here in the late 1950s, while completing the development, work that was the lead to the Belvedere, Sycamore production continued, and Hafner maintained an active project office. In 1959, the UK government called for amalgamation of all the British helicopter manufacturers into a single entity led by Westland helicopters Ltd. The result was that Weston-super-Mare was used as a development site, project office and production facility until the late 1970s. In addition to the helicopter engineering work that has taken place here, full recognition must be given to the presence of the Helicopter Museum, which from small beginnings has grown into one of the biggest and most important helicopter museums in the world. On this airfield, the Bristol Aeroplane Company’s Helicopter Division manufactured the Sycamore helicopter from 1955 to 1959 and performed the first flight of the Belvedere tandem-rotor helicopter on 5 July 1958. The factory became the Weston division of Westland Helicopters in 1960, assembling or overhauling more than 400 Wasp, Scout, Whirlwinds, Sea Kings, Pumas and other types before its closure in 2002. Today, the Helicopter Museum, which opened on the airfield in 1989, keeps the heritage of the site alive.